Chromatic Bytes released version 1.1 of Shades, its addition to the Apple OS X color picker. 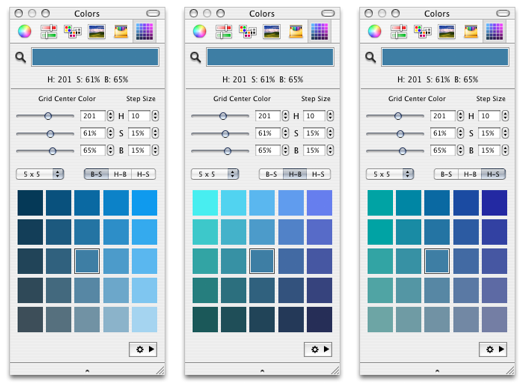 Shades helps users select a color by showing a grid of closely related colors. Version 1.1 adds support for hex strings for html colors. - Holding the mouse over a color chip gives a tooltip that shows the hex string for the color as well as its RGB and HSB values. - Option clicking on a color chip loads the hex string for that color into the clipboard so that it can be pasted into an HTML editor. Version 1.1 also fixes a problem that would cause Adobe Lightroom to hang when Shades is used with Lightroom. Shades 1.1 is a free update for current users.